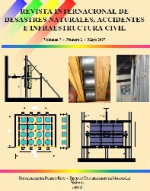 The International Journal of Natural Disasters, Accidents, and Civil Infrastructure is a scientific and technical journal which began publishing during mid-2001, under the sponsorship of the Department of Civil Engineering and Surveying of the University of Puerto Rico, Mayaguez Campus. Annually, from two to four volumes are published. Each issue of the journal includes up to ten works, depending on the number of pages of the articles. For more information, click here. Educational Reaches, International Relations, New Technologies for University-Industry-Government Relationships.